Who could resist this fresh and flavorful twist on grilled cheese" This Sun Dried Tomato Spinach and Ricotta Grilled Cheese is a must try grilled cheese sandwich! It's loaded with three kinds of cheese and it has that delicious flavor combo of sun dried tomatoes and spinach. This is a sponsored conversation written by me on behalf of Sara Lee® Bread. The opinions and text are all mine. Grilled Cheese April is National Grilled Cheese Month! What better way to celebrate than this hearty grilled cheese" It's perfect for lunch or dinner. It really just makes that plain old cheddar grilled cheese sandwich seem ultra boring! 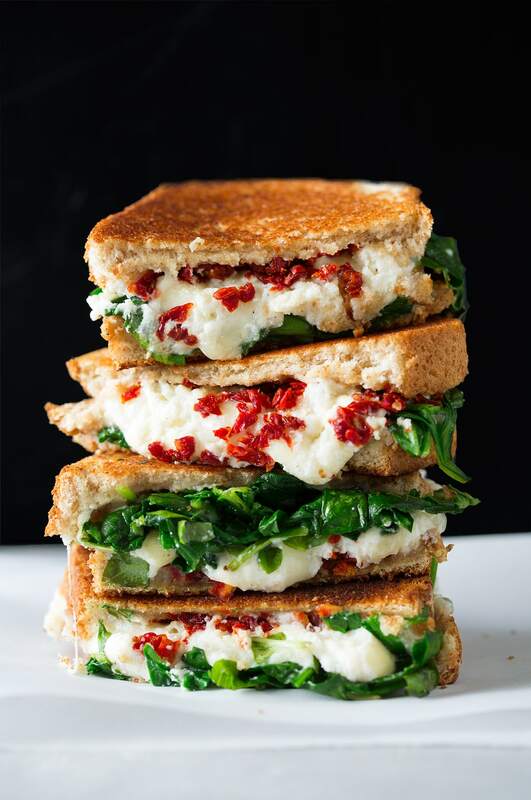 Layered together over soft cracked wheat bread is steamed fresh spinach, fresh basil, creamy ricotta, rich provolone, salty parmesan, and those rich ultra flavorful sun dried tomatoes. This is a grilled cheese I'll want to make time and time again! I've already made it twice and can't stop thinking about it.